For anyone who has day dreamed about opening their own successful coffee shop, there will have been those moments you've analysed all your favourite haunts for elements you could adapt and make your own. But it's not so easy to take your ideas and shape them into a real life welcoming interior. Often a lack of thought at the initial planning stage or critical business mistakes can cause nearly 60 per cent of new café and restaurants to fail in their first year. With little margin for error, you need to set your café and restaurants up for success from day one. 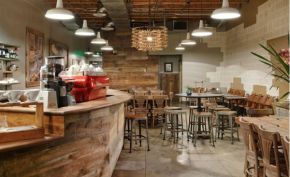 These 5 design tips about what cafés and coffee shops should aspire to achieve - should be a good starting point to turn your dreams of opening your own café and make that vision a reality. Follow these simple rules to make your customers feel welcome and more importantly - keep them wanting to come back. This is an important issue to consider carefully from the outset. Space should have a definite purpose. Is your shop going to be a gathering place for friends? If so - ensure there’s plenty of room for groups. Or if your shop attracts business people rushing to the office or appointments, set it up to let people get in and out quickly. And if your shop’s a place for people to chill and sup plenty of warm drinks and scoff cake, place comfy seats in areas with inviting lighting. You may consider a dimly-lit underground speakeasy the perfect place for that late-night cocktail, but it’s not necessarily a winner for your cup of morning coffee. Sunshine (British weather permitting) leaves customers feeling upbeat and positive (and more likely to spend), while a view of the outside world gives them a way to escape the worries of home or the work desk. Whether for the view or the opportunity to people-watch, your customers and regulars will love having natural light to bask in. Quite often overlooked but easily one of the most vital factors in maintaining cheerfulness amongst customers is lighting. Great menus, good service and a welcoming interior cannot make up for the feeling of discomfort created by bright lights. In these conditions, food can also dramatically change colour, the meat turns grey and vegetables take on a bluish hue. Most often this woeful state of affairs can be avoided be getting appropriate lighting such as a soft ceramic ceiling light. Imagine yourself in a restaurant with your partner. Interior is beautiful, and service is excellent but the lights are so bright that they permanently destroy your idea of enjoying an intimate atmosphere. Good lighting involves combining daylight with electric light. Daylight is naturally the most comfortable and the task of the electric light is to imitate it. This combination is fundamental to having a pleasant lighting. Whilst it is important to keep a general aesthetic goal in mind - it’s also vital to have fun with the whole process of building or modelling your cafe or coffee house. Whether you are going at it alone or have hired a professional to make it happen, ensure your final outcome includes a bit of your own personality to make it a space that you will love working in for years to come. To achieve the ultimate design goal of what we call in the industry - a clean design, lean towards a simple Cafe Interior Design with basic furniture. Cleanliness isn’t just clearing tables and mopping floors. Use just enough decoration - and pieces which will add value to your centre. Make sure every element of design in your café shop has carefully been considered before you start to install it.